The book covers the period from 1812, when the Tron Riot in Edinburgh dramatically drew attention to the ‘lamentable extent of juvenile depravity’, up to 1872, when the Education Act (Scotland) inaugurated a system of universal schooling. During the 1840s and 1850s in particular there was a move away from a punitive approach to young offenders to one based on reformation and prevention. 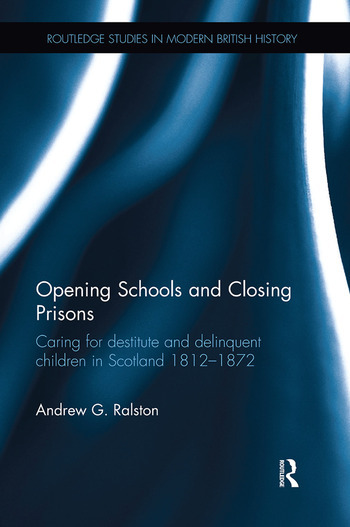 Scotland played a key role in developing reformatory institutions – notably the Glasgow House of Refuge, the largest of its type in the UK – and industrial schools which provided meals and education for children in danger of falling into crime. These schools were pioneered in Aberdeen by Sheriff William Watson and in Edinburgh by the Reverend Thomas Guthrie and exerted considerable influence throughout the United Kingdom. The experience of the Scottish schools was crucial in the development of legislation for a national, UK-wide system between 1854 and 1866. Andrew G. Ralston, a student at Glasgow University in the late 1970s, was encouraged by the late Geoffrey Finlayson, author of the definitive biography of Lord Shaftesbury, to take an interest in the history of the treatment of destitute and delinquent children in nineteenth-century Scotland. Having completed a degree of D.Phil at Balliol College, Oxford University, he has subsequently co-authored over twenty successful school textbooks.